Worcestershire Sauce, & 1 tbsp minced garlic, overnight. – Saute’ 1/2 cup sliced mushrooms & 1/2 cup diced onions in a pan with Nature’s Promise Olive Oil Spray. 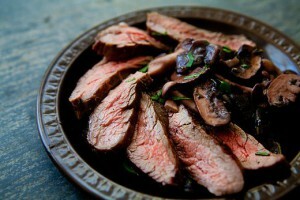 – Slice skirt steak into thin slices, top with sautéed onions & mushrooms, & minced parsley as garnish. 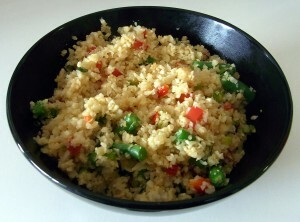 – Serve with the Cauliflower Fried Rice recipe below. 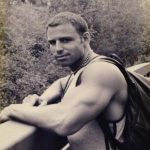 – Spray a large cooking pan with Nature’s Promise Olive Oil Spray. – Saute’ minced garlic, diced onion, & diced red pepper for 3 minutes. – Stir in grated cauliflower, scrambled eggs, soy sauce, & olive oil. – Stir the mixture frequently for 6 minutes. Lent has ended, and steak’s back on the menu! The warm Spring weather that we’ve been having is a perfect sign that it’s time to start grilling again! I hope that you enjoy Remedy Recipe’s version of Cauliflower Fried Rice, as it compliments the Marinated Skirt Steak, wonderfully. This delicious combination may be used for Meal 4 on the Remedy Recipes format. Portions: women- 3 oz. grilled skirt steak, 1 cup cauliflower fried rice/ men- 6 oz. grilled skirt steak, 2 cups cauliflower fried rice. A salad may be added to this meal as well.